Thermoelectric coolers are used now in many applications. There are four key TEC parameters you may find in any specification from TEC vendor: dTmax, Qmax, Imax and Umax. 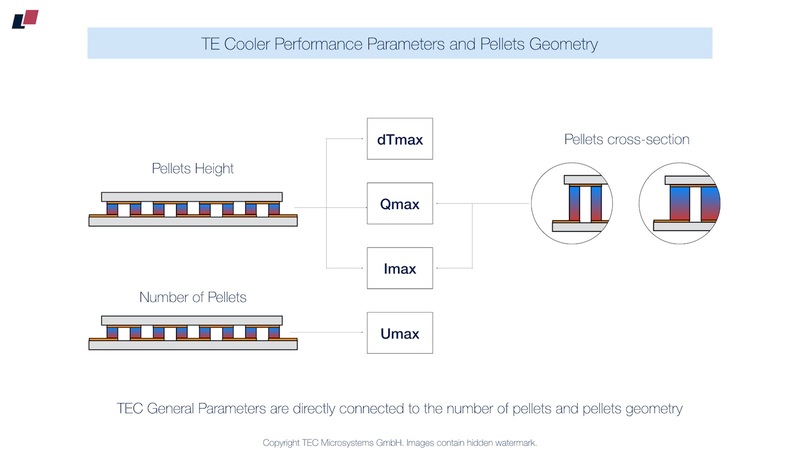 First two - dTmax and Qmax parameters - are the most important for TE cooler - they indicate TEC performance level. Second two - Imax and Umax - describe the required electrical current and voltage to reach the specified dTmax or Qmax level. 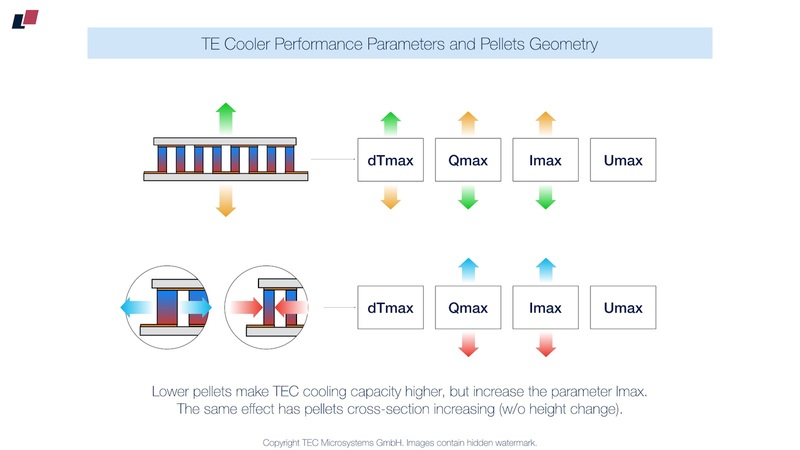 dTmax is the max possible temperature difference that TE cooler can create between its cold and hot sides at zero heatload. It’s very important to understand that dTmax is specified without heatload applied to TEC. Qmax is the max TEC cooling capacity - the level of heat a thermoelectric cooler can pump from cold side to the heatsink. And here we should bear in mind that thermoelectric cooler parameter Qmax is specified at zero(!) temperature difference between TEC cold and hot sides (dT=0). 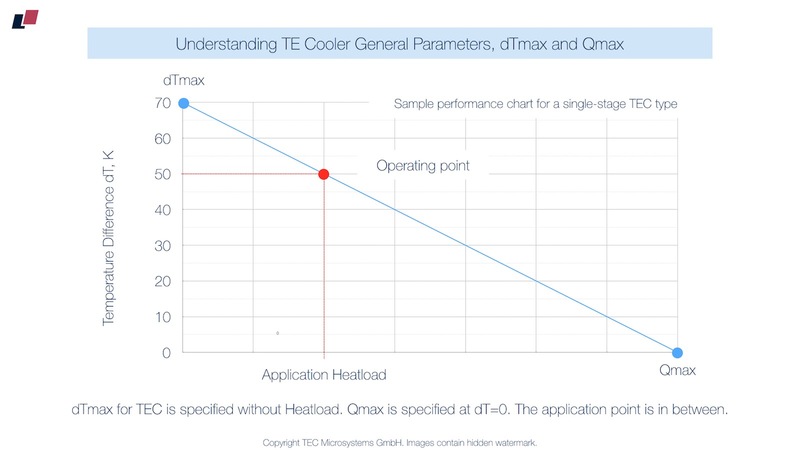 Thus we got two “set points” - dTmax at zero heatload and Qmax at zero dT - both parameters from TEC datasheet are connected, and actual application operating point (with a heatload and required dT under this heatload) is somewhere in between. These two key TEC parameters (dTmax and Qmax) are the first ones to check during looking for suitable TEC and once obtained from TEC datasheet these parameters are accepted as trustful by default, exactly as TEC manufacturer specified, no doubts on customer side. But where are these parameters originally taken from by TEC manufacturers? The interesting fact is that the parameters dTmax and Qmax are estimated by TEC manufacturer using initial Bi-Te material properties and Figure-of-Merit value. The key question is about verification of these estimations, at what conditions they are specified and how close the estimations are to the reality. In the real world it’s always possible to face certain difference between theoretical estimations and real results. In case of thermoelectric coolers there are many factors with more or less valuable influence on actual TEC performance after assembly. And the estimated TEC performance level may have certain difference from actual TEC parameters. Moreover, some TEC manufacturers may apply quite simplified mathematical model and estimations to calculate TEC performance parameters and power consumption (and it’s close to real values as say car fuel consumption in the advert brochure - attractive, but let's say far from not real). Thus the actual TEC performance is to be measured by direct testing and a following comparison with initially estimated values. This is how it has to be done by experienced and reliable TEC manufacturer, by default. Such proof requires advanced R&D equipment and high experience in TEC analysis to exclude all distortions and take into account all corrections during measurements. There can be situations when TEC manufacturer skips the actual proof of TEC performance level and simply specifies the estimated data only. And there are also certain tricks to attract customer attention - making a bit higher values to demonstrate better performance. For example, specifying TEC dTmax=75K instead of dTmax=72K - it looks good in TEC datasheet, it creates good impression, and once it’s dTmax (specified at absolute zero heatload) - nobody needs the precision proofs. The same is about Qmax parameter - it’s specified at zero dT, in real application there is no absolute zero dT, thus why not specify Qmax=10W instead of 9.5W, it looks better, shall we? 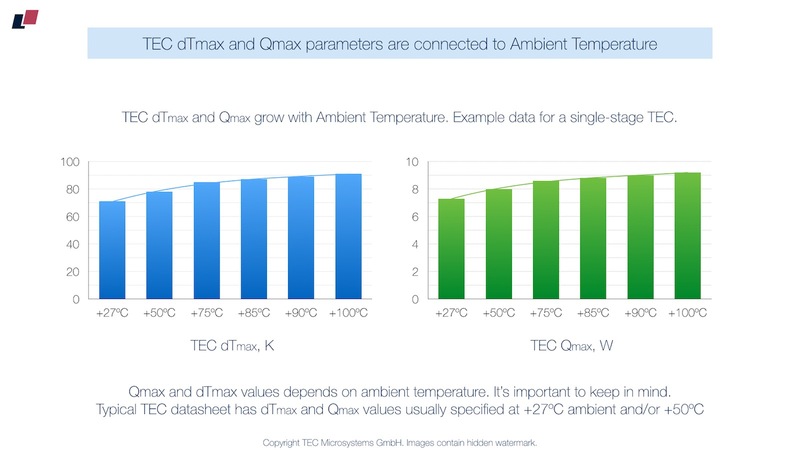 There is another trick - performance values specified at higher ambient temperature (specified usually as Tamb or Thot in TEC datasheets): TEC Qmax and dTmax values grow with ambient temperature. Thus let’s specify dTmax and Qmax at ambient higher than competitors and create an eye-catching effect, why not. In most cases big projects require several TEC vendors, and the initial choice of vendor is made under impression of initially provided technical datasheets and parameters estimations. Same TEC solution, with even slightly higher performance looks better. Thus some slight “advantages” in TEC specs give certain benefits at this stage for TEC vendor (and the price, of course). Usually TEC consumer has no real ability to proof the exact TEC max performance level, TEC consumer simply relies on datasheet values as specified. TEC max performance parameters are required for the initial TEC choice and very rough analysis only, they technically create an initial impression and give a start for next level negotiations, while actual TEC performance is to be tested later in real application conditions. Marketing tricks are used for thermoelectric industry, same as in many others. TEC key parameters in datasheet can be specified at say 50ºC ambient, while other vendors can rate it at 27ºC by default - and there will be a valuable visual difference in terms of dTmax and Qmax. It will be valuable enough to attract customers at initial TEC choice stage. 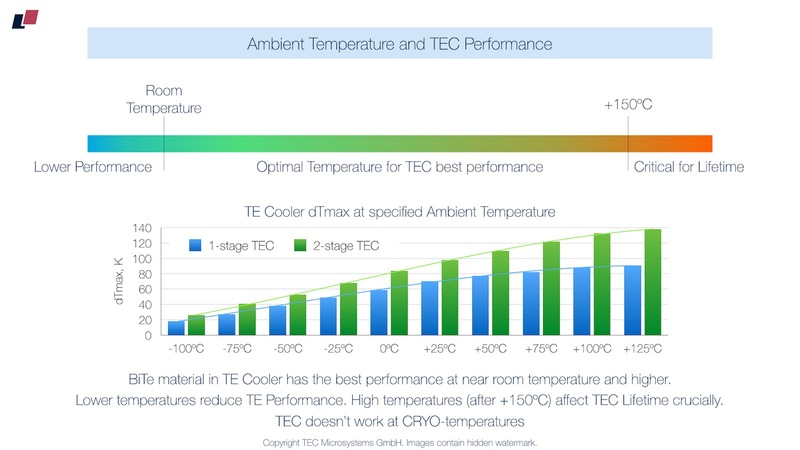 Some TEC manufacturers go far more and specify TEC max performance parameters at much higher ambient temperature, and it looks great in datasheet, while in fact the performance is the same (or even lower) as other vendors have, if to specify it at 27ºC ambient temperature. HINT: the very first thing to check when you're looking at performance parameters in TEC datasheet is the ambient temperature, at which TEC performance data is specified. In most cases it's noted as "Tamb", "Thot" or "Th" in the datasheet ("Thot" and "Th" means temperature of TEC hot side, which is accepted equal to ambient temperature in optimal conditions). When it's not specified, it's important to ask TEC manufacturer to avoid any misunderstadning. Most of TEC vendors specify TEC performance data at +27ºC and +50ºC. 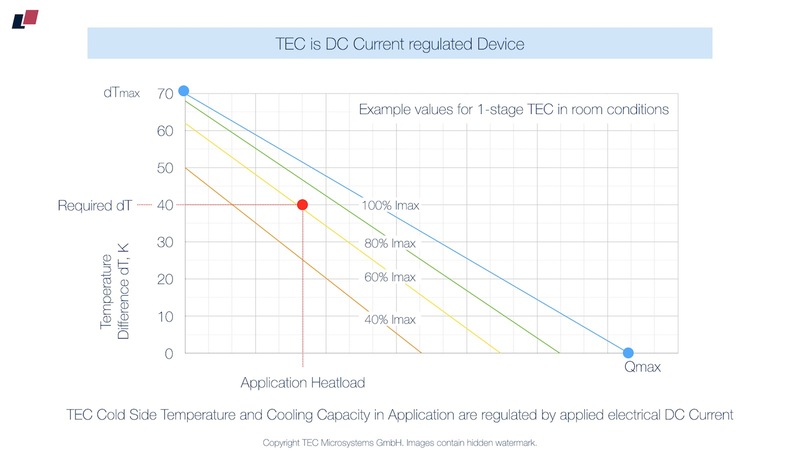 Next important moment for TEC performance datasheet study is the ambient conditions - gas or vacuum. 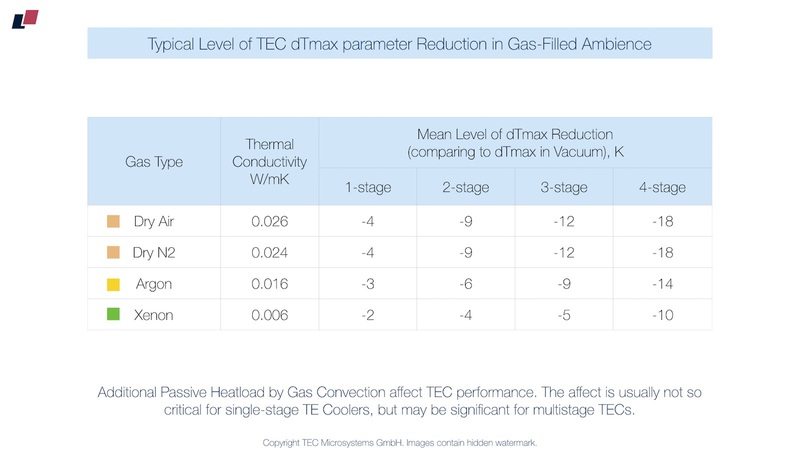 TEC demonstrates the best perfomance in vacuum, without a passive convectional heatload from gas ambience. In case of gas-filled ambience the convectional heatload from it has certain affect on TEC parameters, directly proportional to TEC size. The larger TEC size is, the more affect from convectional heatload. Traditionally TEC vendors specify performance parameters at +27ºC in vacuum, and +50ºC in Dry Air or Dry Nitrogen. This historically comes from typical TEC applications: X-Ray or IR-detectors in vacuum sealed packages operating at near room conditions, and typical laser (LD) applications with operating temperatures closer to 50ºC, with no vacuum required. 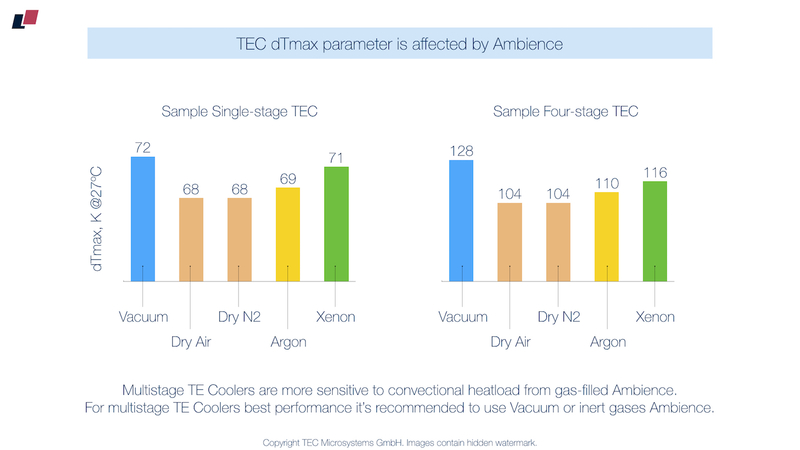 And if for case of single-stage TE coolers there is no big difference in terms of max perfomance in vacuum or gas-filled ambience, multi-stage TECs are pretty much sensitive for such things. In case of experienced support from TEC vendor all the estimations about TEC actual power consumption in the operating mode can be provided. The actual testing results in operating mode have to match the estimations, ideally… But it’s a real world, and the actual results may differ from the estimations. All these may lead to certain debates between TEC supplier and TEC consumer. Here is a quite typical situation: TEC consumer specifies application requirements (in terms if TEC size, operating conditions, heatload level and required dT), TEC vendor suggests optimal TEC solution and provides necessary estimations; consumer installs TEC and observes higher power consumption than estimated by TEC vendor, or lower TEC performance level. TEC vendor is pretty sure about estimated values, TEC consumer is pretty much sure about design and specified application conditions. Where is the problem? There can be various reasons for that. Incorrectly estimated application conditions: higher ambient temperature; overheating due to improper heatsink or poor thermal contact; excessive heatload to TEC; ambient influence (unexpected convectional and radiational passive heatload) and etc. Also it’s possible to get TEC performance drop because of certain impacts or damages during device assembly / TEC integrating stage. Or the interesting case - actual TEC performance may have certain deviation from datasheet values or TEC manufacturer estimations, because of insufficient or simplified mathematical model in estimations. Thus there should be a reliable mechanism of TEC performance verification and approval - a laboratory testing system where you can make actual TEC application operating conditions and apply a precisely controlled heatload to test TEC real performance level directly, in praxis. Once such verification approach is implemented (realized), it’s easy to analyze the results and get the real verified TEC performance level. Then it’s possible to analyze the reasons of obtained deviations with theoretical estimations - if it’s about unexpected application conditions like overheating or excessive heatload, or actual deviation of TEC real performance values from the estimated values. 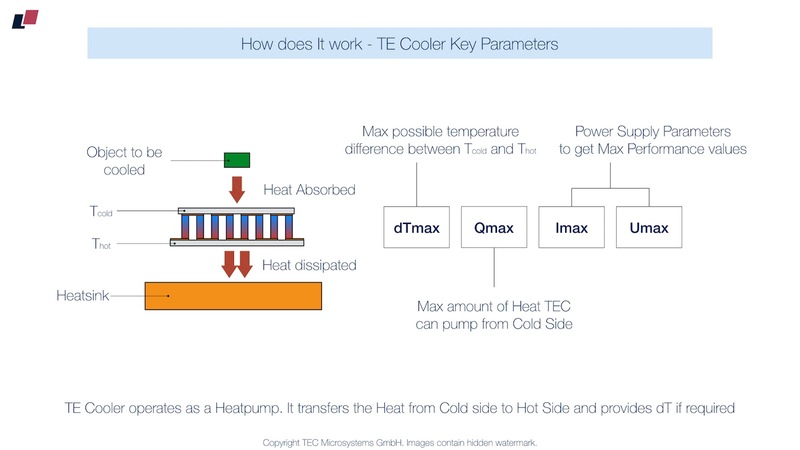 TEC Microsystems GmbH with already ten years of experience in thermoelectric coolers analysis, development and manufacturing setup offers the unique service - direct testing of TEC performance and power consumption. All TEC performance parameters can be analyzed and measured directly. The analysis is made with specially developed professional TEC testing system - DX8020 TEC Expert (available also for ordering). Story #1: Customer observes significantly higher power consumption in application conditions, different to estimations initially made by TEC vendor. Direct TEC testing in laboratory proofed the correct estimations of TEC vendor, estimated values matched direct testing results. Following detailed analysis of customer application and design revealed significant passive heatload level, not taken into account. Problem solved. Story #2: Customer observes lower performance level of TEC in real application conditions, had doubts in TEC parameters specified by vendor. Direct TEC testing was ordered as 3-rd party expertise. Laboratory proofed the problem, customer design had no mistakes despite of TEC vendor statement, actual TEC performance level was found ~15% lower than expected. Customer switched to reliable TEC vendor. Story #3: Customer claimed higher TEC power consumption, much higher than expected from estimations provided by TEC vendor. Direct TEC testing in TEC Microsystems laboratory proofed the performance level of TEC. The detailed analysis of customer design revealed 2-wires measurement scheme for TEC voltage and serious voltage drop on header pins, connected to TEC. Problem solved. Story #4: Scientific center ordered detailed TEC performance analysis in vacuum conditions and possible risks of performance drop in case of leakage and gas-filled ambiance. Analysis made, optimal TEC solution with cooling capacity reserve was found and approved. Story #5: Customer ordered detailed comparison analysis of thermoelectric coolers made by bulk and thin-film technology in various application conditions. Significant advantages of bulk TEC technology was confirmed in specified application conditions. Story #6: TEC vendor applied changes in technology with related PCN to customer. TEC parameters remain the same, but customer observes certain performance differences with new solution and initiated RMA discussion with TEC vendor. Direct TECs testing was ordered and used as 3-rd party expertise. Direct TEC testing revealed moderate changes in updated TEC solution. Both sides came to an agreement, problem solved.